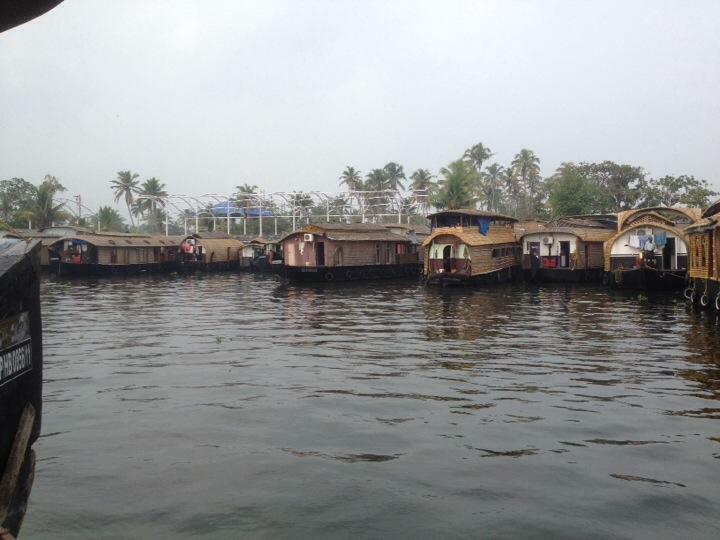 Having consulted lonely planet and trip advisor, an overnight boat trip on the backwaters of Alleppey was a must! The drive to Alleppey took us through various villages and along beautiful rivers and canals. This place reminds me of Fiji. The weather is tropical and humid, which is good for Mark's cutting. The boats are beautiful! The exterior is a kind of flax, but they are far more sophisticated than I had expected! Every one has power, air conditioning and a working, European toilet. The trip was very serene and relaxing, I can definitely see how people could do this for a week! The only downside was the Mosquitos but I have been taking malaria tablets so I wasn't too concerned! We moored at night on this island, and we went to explore it around dusk. There are elections here and there was some sort of political debate, which Mark was very interested in. He really loves his political yarns! The food on the boat was beautiful, quite different from what we had previously experienced. The flavours were infused with coconut and very creamy! This is common in the south, and the more I experience of India, the more I have come to realise that each state is very different. It's like travelling through Europe, only the countries are just states, with their own unique traditions and experiences.